Getting fit doesn’t have to feel like hard work. It can be fun! Take a class at any one of these great studios and you’re guaranteed a lively, energetic dance experience that dou-bles as a workout. Here are the 10 best places for Zumba in New Mexico. This fast dance-aerobic class is a complete cardiovascular workout. A fusion of Latin and salsa music pumps along as you move along to the pulsating beat. It’s a dance class that bills itself as an exercise class. The most fun workout you’ll ever have. Classes are twice weekly. Walk-in option or by a punch pass for a series of classes. Gino’s has been helping the community stay healthy for more than 30 years. Lose yourself in the music and get in shape. The dance party at this fitness center features high-energy Latin music and a pulsating range of international beats. This exhilarating workout combines toning and strength moves with step aerobics … and it’s fun! Classes throughout the week for all levels of fitness. Drop-in or get a discount for multiple classes. A place of empowerment, education and motivation to get you into shape. How about aqua Zumba? What?! Get in the pool and sashay yourself into better health. There’s a Zumba class here for just about everyone. Traditional includes dance moves plus hi-low aerobic combinations, curls, crunches and push-ups. Zumba Gold is for the active older age group. Zumba toning to improve muscle firmness. Weekly classes for all four options. Fitness expert, Bentley Laaksonen incorporates his expertise in modern dance, hip-hop, African, flamenco, Mexican folk and ballroom into his vigorous Zumba classes. It’s a fun and exhilarating way to sweat, burn calories and improve your endurance and fitness condition. Classes are weeknights. Cost is by the class or series. Two locations in town. The membership club is open seven days a week and boasts a host of trained professionals to get members to their fitness goal. One tool in their good health bag of tricks is Zumba. This club has a pool which means Aqua Zumba! Dry land classes also for those not wanting to get wet. Participants have the option to choose songs and dance genres… bring back your favorite! Classes weekly. Put your sneakers on and take your first class here free of charge. No obligation to go back. Although instructors here promise you’ll feel so good you’ll want to return. Every class is a dance party but knowing how to dance is not a requirement. Zumba is just the beginning. There’s also emphasis on toning, strength training and the overall importance of diet and exercise for a healthy lifestyle. Drop-in, by a 10-class pass or pay monthly. Classes are daily. If you’re looking for a positive lifestyle change, this is the place. A blend of conditioning equipment to personal training to weight loss guidance to Zumba classes all work to help you create a fitness routine that reaches personal fitness goals. Zumba classes add a level of fun to the whole process. This class incorporates hand-held weights, in addition to the flamboyant dance moves, to ensure an exhilarating workout. Classes held weekly. Get your groove back … or takes steps to find out where it went at this dance studio where instructors have a passion for dance and movement. 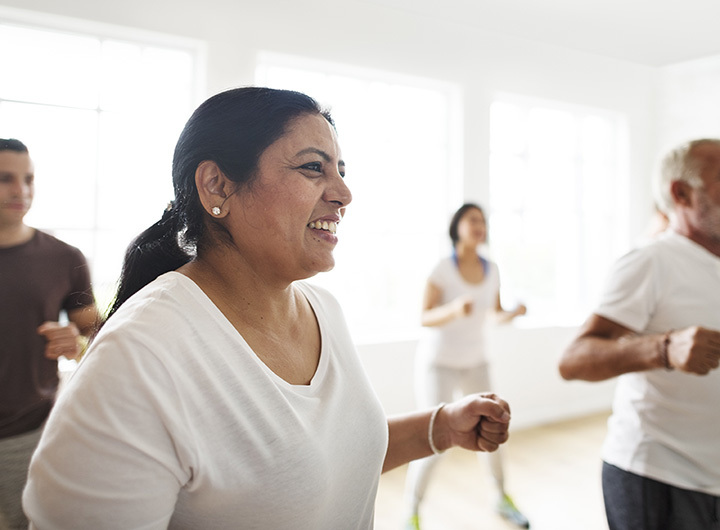 Zumba classes incorporate all their favorites and you’ll hip-hop your way through soca, samba, salsa, merengue, mambo, martial arts, as well as belly dance and even Bollywood routines. They’ll throw in a few squats and lunges—a nod to fitness training. Go for a class, or four or eight. Classes held sporadically during the week. Laura has a following of Zumba lovers who dance to her fun, positive, energetic and supportive instruction. Her motivation includes great music, energizing movements, strength components, cardio and some abdominal crunches. Her motto: there are 1,440 minutes in a day, spend 60 on yourself. Classes held Monday through Thursday.